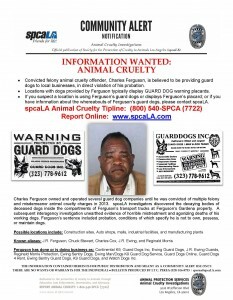 Los Angeles, CA – Convicted felony animal cruelty offender, Charles Ferguson, is believed to be providing guard dogs to local businesses, in direct violation of his probation. Society for the Prevention of Cruelty to Animals Los Angeles (spcaLA) is asking for the public’s help. If you suspect a location is using Ferguson’s guard dogs or displays Ferguson’s placard; or if you have information about the whereabouts of Ferguson’s guard dogs, please call the spcaLA Animal Cruelty Tipline at (800) 540-SPCA (7722) or report online at www.spcaLA.com. Dowload Community Bulletin Here . Ferguson, former owner and operator of J.R. Ewing Guard Dogs, Inc. et al, was convicted of 4 felony and 4 misdemeanor animal cruelty counts in September 2013 as a result of a spcaLA animal cruelty investigation. spcaLA investigators discovered the decaying bodies of deceased dogs inside the compartments of Ferguson’s transport trucks at Ferguson’s Gardena property. A subsequent interagency investigation unearthed evidence of horrible mistreatment and agonizing deaths of his working dogs. These findings and others resulted in Ferguson’s November 2012 arrest and ultimate conviction. Ferguson’s sentence included probation, conditions of which specify he is not to own, possess, or maintain dogs.